Guild’s iconic M-20 was the first guitar off the production line in 1967, when the company had grown so much that they relocated to a new factory in Westerly, RI. Nearly 50 years later, history has repeated itself in a brand new, state-of-the-art facility in California. 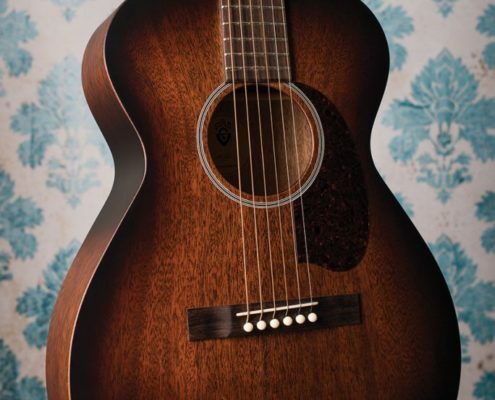 The M-20 is a concert size acoustic guitar built with solid mahogany top, back, and sides, informally nicknamed “the Nick Drake guitar” for its inclusion on the album art for Drake’s album, Bryter Layter. It features a rosewood bridge and fingerboard, bone nut and saddle, and an extremely light satin finish that allows this guitar to truly sing. The M-20’s modest appointments include a vintage style rosette and Guild’s peak logo inlaid in mother-of-pearl on the headstock. Each M-20 comes with a hand-signed, numbered certificate of authenticity, and ships with a hardshell case. Available in Natural, Vintage Sunburst, Natural with LR Baggs pickup (M-20E Nat), and Sunburst with LR Baggs pickup (M-20E VSB). Unlike typical undersaddle acoustic guitar pickups that are dependent on string compression for their sound, the L.R. Baggs Element Active System with Volume and Tone Control was engineered to mirror the soundboard’s movement as you play. At the heart of the pickup, a thin, flexible film sensor picks up the guitar’s most delicate nuances. With unrivaled dynamic range, the Element’s minimalist construction creates an intimate coupling between the pickup and guitar for the highest fidelity possible. In addition to its treble tone control, the EAS-VTC features a revolutionary low frequency compression circuit which actively controls low end dynamics, creating an incredibly realistic and reliable amplified tone. The L.R. Baggs Element VTC pickup system is made in California, USA.